This mid-sized female, however, wasn’t going to stop with an “x” but had added half of a central vertical stroke and a hint of the other half when I saw her yesterday. Her web is the same today, so that must be how she likes it. Why? No-one knows. In fact, no-one knows why spiders add any of these decorations to their webs. 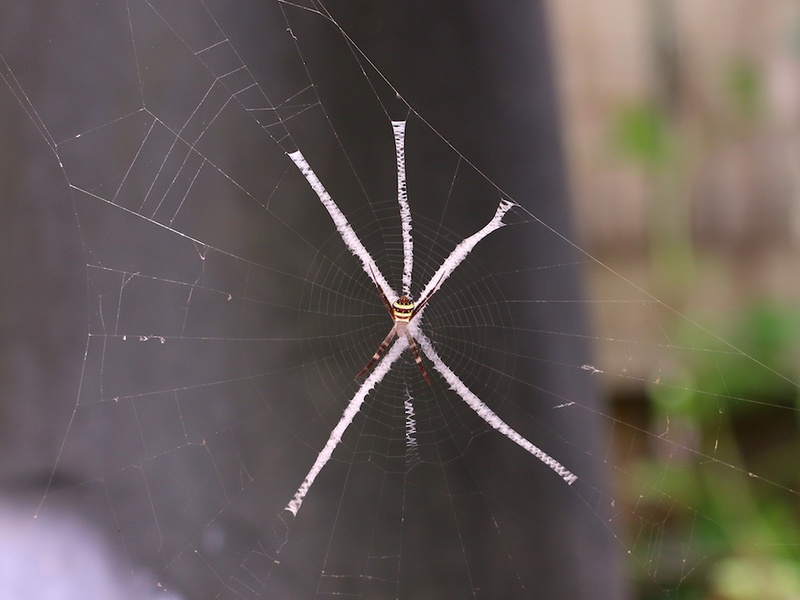 Other orb-weaving spiders add different kinds of solid-looking components to their webs. Cyclosa species, for instance, construct a bar of prey debris across the centre of their web, in which they very deliberately camouflage themselves, but there is no guarantee that this behaviour is related to the Argiope species’ construction of a stabilimentum.